Equifax to Boston Herald Readers: Fax You! 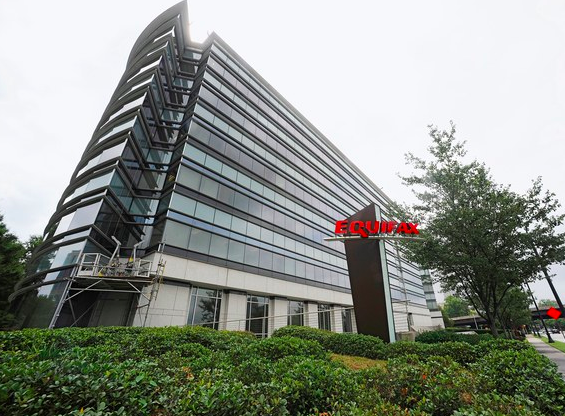 As you splendid readers no doubt know, the credit-monitoring firm Equifax has faxed up in a major way, both in letting sensitive information about 143 million users get hacked, then in its response to the breach, as Wired’s Lily Hay Newman has reported. THE BREACH OF the credit monitoring firm Equifax, which exposed extensive personal data for 143 million people, is the worst corporate data breach to date. But, incredibly, the mistakes and the superlatives don’t end there. Three weeks since the company first publicly disclosed the situation, a steady stream of gaffes and revelations paint a picture of Equifax’s deeply lacking response to catastrophe. 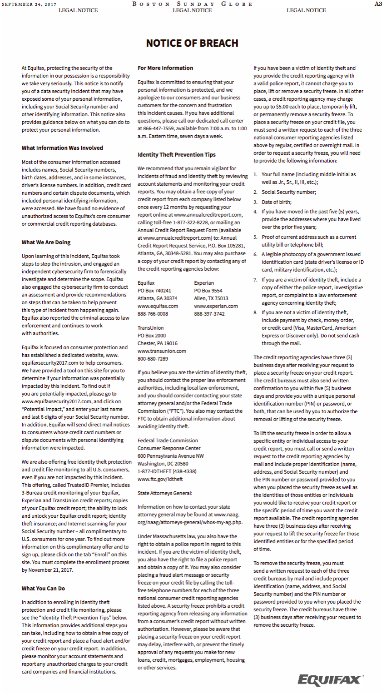 Part of that “deeply lacking response” is this full-page ad that ran in yesterday’s Boston Sunday Globe. There’s all kinds of lawyered-up corporate speak in the ad which we won’t bore you with because, well, it’s lawyered-up corporate speak. But what we will say is this: Hey, Equifax – where’s your “Notice of Breach” to Boston Herald readers? You think they don’t care about their credit scores? You think they don’t worry about identity theft? It was a virtual crustacean collision in the local papers yesterday, as stories about oddly colored lobsters appeared in both. Start with this piece in the Boston Globe’s Metro section. On Wednesday, the New England Aquarium in Boston announced it had received a donation of a rare yellow lobster, a “one in 30 million” catch from the coast of Marblehead. That same day, the Bangor Daily News reported a Maine man had caught a “one in 100 million” white lobster last week. Those were just the latest examples of what seem to be increasing reports of good-fortuned lobstermen hauling in crustaceans with exceedingly rare hues. 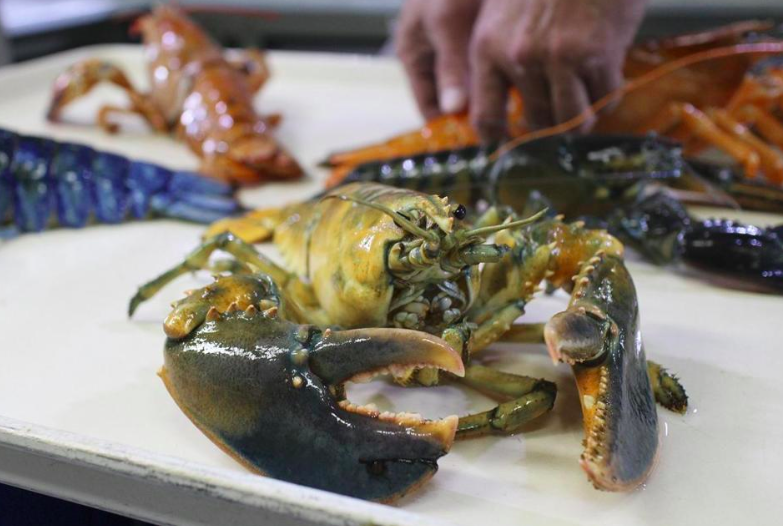 Globe reporter Matt Rocheleau even played oddsmaker, listing a color wheel of rare lobsters. ■ Split-colored: one in 50 million. What are the odds that a lobster of a different color would turn up in the Boston Herald (via the Associated Press) the same day? Here’s the ghostly guy himself. So, happy ending: One went to the Marian Manor of crustaceans, while the other returned to the briny deep. Obviously – and mercifully – hold the drawn butter. You are currently browsing the It's Good to Live in a Two-Daily Town blog archives for September, 2017.